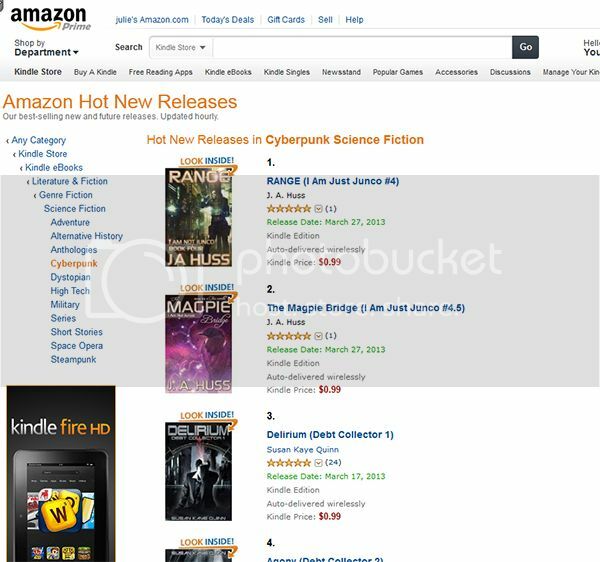 RANGE and MAGPIE are number one and two in cyberpunk hot new releases. Granted, cyberpunk is not a smokin’ category, but we own it right now because FLIGHT and RANGE are both number five and six in the whole genre. Are they coming as paperbacks also? Or am I going to have to gift myself with a reader to read these? Hey Charlie – yes, I will probably get the formatting done soon. I’m on a huge deadline for two more non-Junco books, so the paperbacks are a little late, but by mid-may, they should be out. Sometimes it takes a while to get the covers to print correctly because the art is so dark and detailed, so that takes some back and forth time with the printer. The covers are totally awesome think you could make some dinero making T-shirts with your covers. Best of luck with all your books! Well done. Congrats on that!